The CSS Shenandoah, commanded by James Iredell Waddell of North Carolina, was one of the most famous "commerce raiders" or "cruisers" commissioned by the Confederate navy to destroy northern merchant shipping during the Civil War. When European nations refused to allow Confederate privateers to sell their prizes in European ports, the Confederate navy looked for other ways to destroy Union ocean commerce and compel northern shipping interests to lobby the U.S. Congress for peace with the South. The commerce raiders supplied the means. They were Confederate naval warships less motivated by profit than privateers. The Shenandoah's main mission was to destroy the Union whaling fleet and move the war to New England, which, according to Waddell and the South, bore much of the responsibility for the war. Between 27 May and 28 June 1865, the ship captured or destroyed about 25 northern whaling vessels, a blow from which the fleet never recovered. During this time, Waddell learned that Gen. Robert E. Lee had surrendered and Richmond had fallen, but also that President Jefferson Davis was calling for continued resistance. Waddell moved to attack Union shipping in San Francisco, but as he approached the city, a British ship confirmed that Davis had been captured and the South defeated. Rather than surrender to the Union in California or intern the Shenandoah in a neutral port remote from European civilization, Waddell decided to sail to England and end its voyage there. The Shenandoah rounded Cape Horn and hauled down the Confederate flag for the last time in Liverpool, England. Waddell surrendered the ship to British authorities on 6 Nov. 1865, nearly seven months after Lee had surrendered at Appomattox Court House. The British released the officers and crew, but the ship itself was turned over to the Union. After an unsuccessful attempt to sail to the United States, the Shenandoah was sold to the Sultanate of Zanzibar. In 1879 the Shenandoah sank in a storm. Murray Cromwell Morgan, Dixie Raider: The Saga of the C.S.S. Shenandoah (1948). Warren F. Spencer, The Confederate Navy in Europe (1983). "CSS Shenandoah (1864-1865). 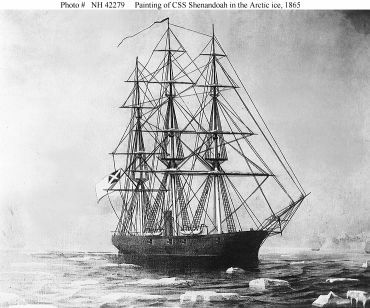 Painting depicting the Confederate cruiser in the Arctic ice, circa June 1865. This image has been credited to the "Illustrated London News", though it appears to be a painting on canvas and not a line engraving. U.S. Naval Historical Center Photograph." Image Courtesy of Naval Historical Center. Available from http://www.history.navy.mil/photos/sh-us-cs/csa-sh/csash-sz/shendoah.htm (accessed May 25, 2012). 1 January 2006 | deTreville, John R.
My 2nd great grandfather, Thomas Barry, may have served on the CSS Shenandoah. I am looking for a list of the crew members. Every reference I have seen only lists the officers. Tom was a licensed engineer and later served on a number of steamboats out of New Orleans, including the Robert E Lee. Does anyone know where the Shenandoah sank? I'm interested if any one has dived the wreck? Thanks! I have found references indicated that the CSS Shenandoah was turned over to the Royal Navy and then sold to the Sultan of Zanzibar and renamed El Majidi. The ship was reportedly lost at sea sometime around 1872. Unfortunately, I haven't found a vetted reference for this information. Baldwin, John, Last Flag Down: The Epic Journey of the Last Confederate Warship, Crown Publishers, 2007, ISBN 5-557-76085-7, Random House, Incorporated, 2007. Chaffin, Tom, Sea of Gray: The Around-the-World Odyssey of the Confederate Raider Shenandoah, Hill and Wang/Farrar, Straus and Giroux, 2006. Schooler, Lynn, The Last Shot: The Incredible Story of the CSS Shenandoah and the True Conclusion of the Civil War, HarperCollins, 2005.